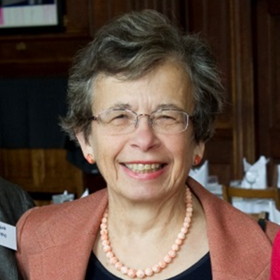 The classical scholar Miriam Griffin, an Emeritus Fellow in Ancient History, has died at the age of 82. Miriam made significant contributions to Roman history, especially to early imperial history and to philosophy in the Roman republic and empire. She was the author of major studies of Seneca (1976) and of Nero (1984), and together with Jonathan Barnes produced two volumes of collected studies on Roman Philosophy Philosophia Togata i and ii. Further works on Roman history and philosophy followed in her retirement, and a volume of her collected papers will appear in June from Oxford University Press, entitled Politics and Philosophy at Rome. Miriam came to Oxford as a Fulbright scholar, after studying at Barnard College and Harvard University, and gained a D.Phil in Roman history. From 1967 until 2002 she was Fellow and Tutor in Ancient History, loved and respected by many generations of Somerville undergraduates in Classics and in ancient and modern history. As an Emeritus Fellow Miriam continued to publish important scholarly works as well as to undertake occasional teaching for the College and to supervise graduate students. On Miriam’s retirement former pupils Gillian Clark and Tessa Rajak brought out a volume of essays in her honour, Philosophy and Power in the Graeco-Roman World. The British Academy awarded Miriam a posthumous British Academy Medal for her lifetime’s contribution to Roman history and ancient thought. Miriam, who died on May 16, is survived by her husband Jasper Griffin, daughters Julia, Miranda and Tamara, and a granddaughter. 2pm, Thursday 31st May in the College Chapel. The Revd Canon Professor Loveday Alexander (Lit Hum, 1965) will preside. Click here to read Lesley Brown’s Tribute to Miriam at Miriam’s Funeral Service on 31 May. There will be a Memorial Service for Miriam in the College Chapel on Saturday 24 November at 2.30pm. All are welcome.